I was recently in Finland and as I walked in the local stores in Helsinki I could not help but notice how superfoods are everywhere these days. Magazines lists benefits and feature recipes, health food section boosts beautifully packed powerfoods or superfoods and then there’s the healthy snacks! I even won a healthy raw choc brownie bar by rolling the dice in eco store Ruohonjuuri – and let me tell you, that was one delicious brownie bar! But for now it’s all about the chocolate! The primary difference between regular chocolate and raw chocolate is that the cacao beans that make the chocolate are not heated above 42°C (107.6°F). As said, I’m no expert and won’t go on listing benefits of eating raw chocolate but you can find loads of information online. For differences between raw chocolate and dark chocolate you can check this list. The following recipe is raw, vegan and sugar free. I have doubled the amount of stevia in the recipe as with the original the end result was bitter. I highly recommend that you taste the chocolate liquid before pouring it into the mould and add sweetness or flavouring as required to satisfy your tastebuds. 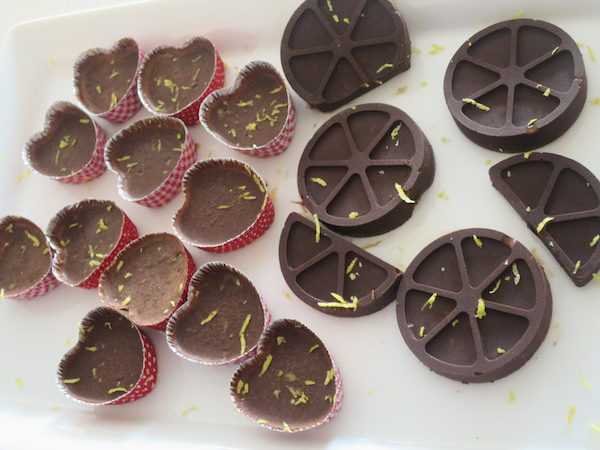 I like bitter chocolate and to me a teaspoon of granulated (as sweet as sugar) stevia was enough to compliment the minty with hint of lemon flavour, but for my husband that was too bitter and he wanted more sweetness. 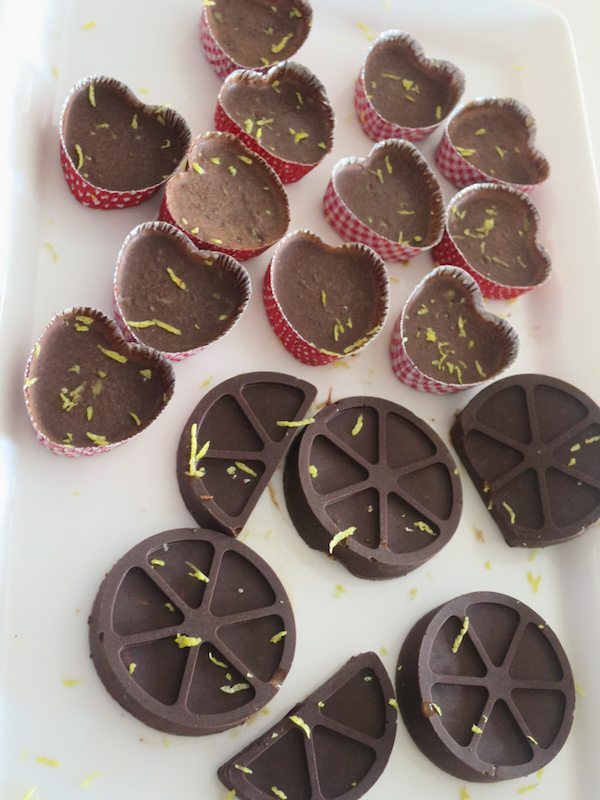 I am planning to do my next raw chocolate batch with coconut palm sugar. 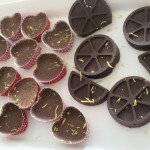 Have you made raw chocolate? Or have you tried a store bought raw chocolate? Measure the ingredients and put a heat proof bowl in a water bath in a saucepan. You'll also need a silicone mold, tinfoil molds or a freezer proof plate. 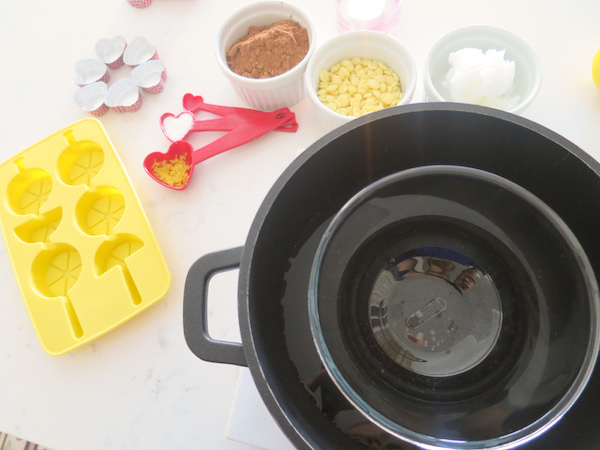 Place coconut oil and cocoa butter in the bowl and place pan over medium heat, mixing until the fat melts into a liquid. Remove the bowl from water bath and mix in stevia and cocoa powder. Add mint and lemon zest and continue to mix until smooth and incorporated. Taste and add sweetener or flavouring as required. 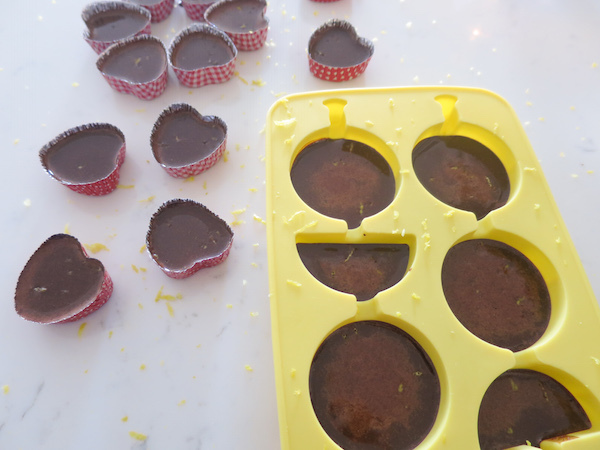 Pour into molds or a plate and place in freezer for at least 30 minutes. Then bring back to room temperature, remove from mold and sprinkle lemon zest on top. Store in refrigerator (up to 2 weeks) or freezer (up to 3 months). Kiitos Jael! Vau, puoli vuotta täysin raw kokeilu varmasti mielenkiintoinen! Itse olen vasta tutustunut aiheeseen lukemalla Jenny Ross:n Healing with Raw Foods kirjaa ja raakasuklaata olen jonkun verran maistellut – myös sitä Goodion ja toin muutaman viimeks Suomesta tuliasena, kaverit ainakin tykkäsivät värikkäistä pakkauksista. Aivan kuten sanoit, ei pysty syömään paljoa kerralla. Laitoin juuri blogisi listaan ja käyn paremmalla ajalla kattoo niitä reseptejä, kiitos paljon vinkistä!